Full disclosure here: I have never, ever picked a lock. I suppose it would be kind of neat to know how to bust into a door with a wafer tumbler lock, but I just never have really experienced the need. An excellent parlor trick, perhaps? A desire to emulate Houdini in a daring escape from the chains of certain death? So what would the purpose be to own a lock picker’s guide, a tiny, neon pink, pocket-sized book from the publisher CrimethInc? The short answer is, I don’t know. It is pocket-sized, which is convenient for those times where you just really have to get a lock picked and don’t have your hardback version of Modern High-security Locks: How To Open Them by Steven Hampton. My guess is, however, that most folks interested in this book probably are not going to be helping old ladies into their Oldsmobiles. Maybe I’m wrong, but I don’t really see a locksmith-in-training using this text as an educational device. Something about the book just didn’t seem right, so I typed in a sentence from the book’s text, and surprise! 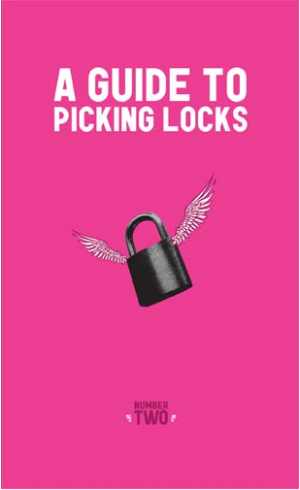 A Guide to Picking Locks, Number Two is really just a hacked-up, poorly photocopied version of the Eddie the Wire book, The Complete Guide To Lock Picking (available free online). The CrimethInc book has no author information, so I’m not sure if Eddie the Wire was involved in this version or not. Contacting CrimethInc was a hopeless endeavour. Will we ever know the truth? Chances are, probably not. You can buy the CrimethInc book for four bucks online, but I’m not sure exactly why you would when it is available for free. Use your anarchist instincts, lock pickers! Liberate those doomed mink with a free version of this lock-picking text, and avoid paying the man! Cinch up the strings on your hoodie, and make sure your bandanna is secured tightly around your nose and mouth while you access the book free on your iPad. Also, bring your Slim Jim Universal Lock Out Tool Set and make sure you have Febreeze—because as much as I feel for the plight of the mink, the potent aroma of their musk will be nearly impossible to wash out of your mom’s Subaru Forester.